The United States Congress designated the Trapper Creek Wilderness (map) in 1984 and it now has a total of 5,963 acres. All of this wilderness is located in Washington and is managed by the Forest Service. Trapper Creek Wilderness protects nearly all of the Trapper Creek drainage and provides the only pristine anadromous fish habitat in the Wind River watershed. Sparkling streams and waterfalls grace steeply dissected canyons of heavy timber. Spotted owls, pileated woodpeckers and goshawks enjoy the tall, old-growth Douglas-fir forests that comprise the heart of this wilderness. Approximately 24 miles of trail offer access to this wilderness, and approximately half of these trails are primitive trails that are maintained to a lesser standard and can be challenging to follow. 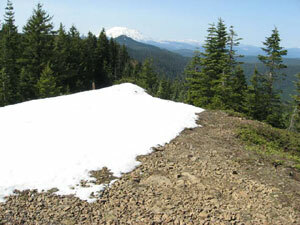 Planning to Visit the Trapper Creek Wilderness? How to follow the seven standard Leave No Trace principles differs in different parts of the country (desert vs. Rocky Mountains). Click on any of the principles listed below to learn more about how they apply in the Trapper Creek Wilderness.